Pierce County is located in western Washington and encompasses major cities such as Tacoma, Lakewood, and Puyallup. The county has a population of about 800,000 residents, making it the second largest in the state. Pierce County is perhaps best known for Joint Base Lewis-McChord, one of the Pacific Northwest’s largest active-duty military bases, and Mount Rainier National Park featuring the impressive, snow-capped volcano of the same name. Pierce County is located on the eastern side of the Puget Sound and also includes some of the land between the Kitsap and Olympic Peninsulas on Carr Inlet. Cities include Tacoma, Lakewood, Puyallup, Steilacoom, Bonney Lake, Orting, and Graham, all of which are well-populated urban or suburban areas. Homes here are often sought by people and families who commute to Seattle or work on the base. This county is just south of King County, which includes Seattle, and north of Thurston County where the state capital of Olympia lies. 3 Beds | 2.5 Baths | 2200 sq. Ft.
3 Beds | 2 Baths | 2064 sq. Ft.
3 Beds | 2 Baths | 1770 sq. Ft.
4 Beds | 3.25 Baths | 3251 sq. Ft.
4 Beds | 3 Baths | 2698 sq. Ft.
3 Beds | 1.5 Baths | 1844 sq. Ft.
4 Beds | 1.5 Baths | 1600 sq. Ft.
3 Beds | 1.75 Baths | 1555 sq. Ft.
4 Beds | 2.5 Baths | 1994 sq. Ft.
3 Beds | 2.5 Baths | 2008 sq. Ft.
3 Beds | 2.5 Baths | 1913 sq. Ft.
3 Beds | 2.75 Baths | 3844 sq. Ft.
3 Beds | 2.5 Baths | 2920 sq. Ft.
4 Beds | 2.25 Baths | 1784 sq. Ft.
3 Beds | 2 Baths | 1436 sq. Ft.
3 Beds | 2 Baths | 1104 sq. Ft.
Blue Summit Realty has the most accurate and up to date Pierce County real estate listings on the web. Currently there are 1,407 homes for sale, 86 condos for sale, 49 rental properties, and 664 vacant land properties in Pierce County. Of the 2,241 total Pierce County residential listings for sale 21 are bank owned, 6 are short sales and 428 are new construction and 2 are townhomes. The price ranges from $80,000 to $5,000,000 with a median list price of $503,121 and median sold price of $363,927. 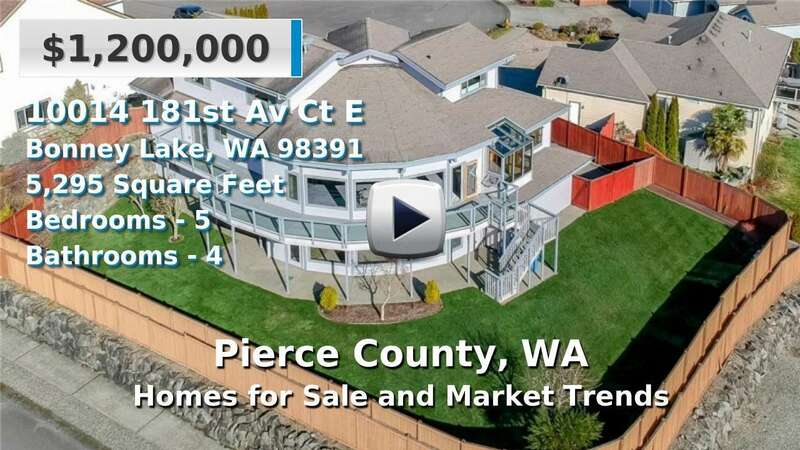 Make sure to refine your Pierce County real estate search by property type, price, square footage, bedrooms, bathrooms and more with the search tool above or view the Pierce County listings on our interactive map. Our Pierce County real estate listings were updated 09 minutes ago.